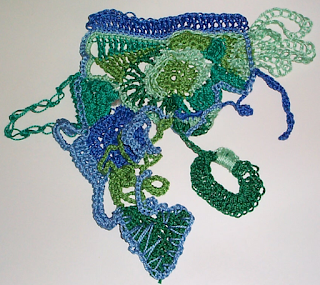 A piece of freeform crochet I did almost ten years ago... yikes! As I was attempting to tidy up my portable hard drive I came by this photo of a freeform crochet piece I did about ten years. It was done with various pearl cottons. I have absolutely no idea whatever became of it. I think I like it more now than I did when I made it.... and I do love working with pearl cottons. I haven't delved into any freeform for a while, but perhaps I should! If you've never tried it before, it can be quite a challenge and a good way to break out of old habits and think creatively. If you'd like to give it a try and you're looking for more inspiration, two of my favorite freeform crocheters are Margaret Hubert and Prudence Mapstone.Check out their work and drool ... it's awesome! I used an old button and a looper for a closing. During my brief break from my day job this holiday season, I actually did a bit of crafting and made this potholder tote bag! No, it's not a bag for toting around potholders, but a bag made up of squares that I created on a potholder loom using loopers. 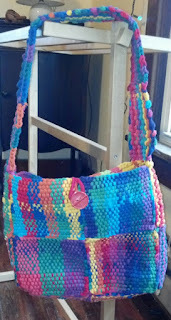 I used a standard metal potholder loom (eighteen pegs) and 100% cotton loopers from Harrisville Designs. They're quite thick and sturdy and the color selection is great. the body is made up of eight squares (four on a side). The handle, sides and bottom are made of half squares. I made the half squares by just looping at half the number of loopers as usual (nine) and weaving through loopers in both directions. It creates one edge that's a bit different from the others... but that didn't bother me. Instead of sewing them together with thread, I decided, because of the weight of the final piece, that I'd use loopers to sew them together. I cut the loopers, used a fairly big needle and joined the seams with using loopers... it just seemed sturdier that way. 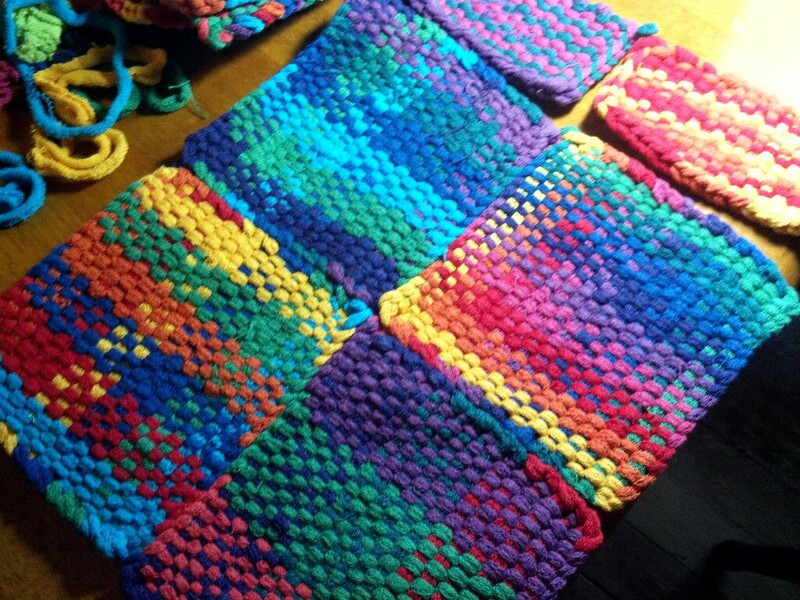 I went for a multicolor look for this project since those were the loopers I had on hand. 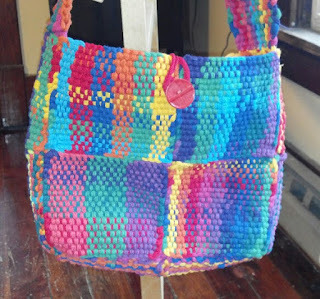 What I like of the Harrisville loopers is that you can purchase bags of loopers of all one color, so if you prefer to work with a certain color combination you can do that. Although I ddon't care much for sewing together pieces/motifs//squares etc ... in projects, this one was not too bad and I would probably do this one again.